In the endlessly toxic world we live in, I have decided to align myself with a safe and high-performing skincare and makeup company called Beautycounter (called such because they are COUNTERing the traditional beauty industry). They have banned more than 1500 toxic chemicals from their products using a rigorous sourcing and testing process for each and every ingredient. Meanwhile, the FDA bans only 15. As a holistic practitioner, I have always advised my patients to read the labels on everything they use as I believe it is essential that we choose only good quality products to put on our skin and the skin of our children. It is part of this push to help my patients clean up their skincare and makeup that made me partner with Beautycounter. Although you may not be aware of it, we are exposed to countless toxins and harmful chemicals every day. From mercury in fish to high fructose corn syrup, hydrogenated fats and oils, phthalates found in cosmetics, soaps and other toiletries we often don’t realize how these toxins not only impact our health, but even how youthful our skin looks. Certain toxins have been associated with infertility, cancer, asthma, diabetes and even autism. We are exposed to harmful chemicals far more often than we realize, so it is vital to choose foods, hygiene products, cosmetics and skincare products and even household items with great care. Carefully reading labels can help you avoid many of the chemicals and toxins that may result in health issues! The most common toxins found in makeup and skincare products include phthalates, oxybenzone, parabens, polyethylene, fragrance, sodium laureth sulfate, lauramide DEA, butylated hydroxytoluene and other potentially dangerous chemicals. You may not realize it, but the skin is the largest organ of the body; what you put on it is absorbed and can be harmful to your health. It isn’t just what you put inside your body, it’s also the products you use on your skin. Thankfully there are toxin-free makeup and skincare products that are truly safe and free of potentially dangerous chemicals and toxins. 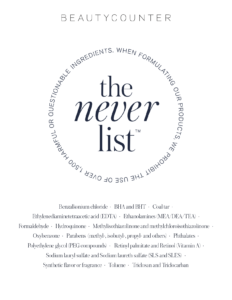 Beautycounter is a skincare and makeup line that never includes toxins in their products, and is dedicated to providing safe products without the more than 1,500 potentially harmful chemicals that are on the “Never List.” From skin care products including cleansers, moisturizers, serums and sun protection to foundation, makeup removers, body wash, hair care and more, Beautycounter is the only line offering products that are indulgent and deliver results yet never contain harmful chemicals or toxins. Eliminate at least some of the toxins you put in your body by using toxin-free makeup and skincare products from Beautycounter! Please Visit www.beautycounter.com/denisewiesner for more information.